Periodically I like to put on some grubby clothes, slather my face with sunscreen, pull on my Hunters and make my way out to my planter beds. From November to March, my beds are a little sparse and contain rogue growth…usually the result of anything I let go to seed the prior season. This year, I had beds full of arugula, parsley (both curly and flat-leaf), leeks, celery, cipollini onions and broccoli. The rain, although not what I had hoped for, helped keep everything going while I pretty much ignored it. Except when I was hungry. During the height of growing season (which is from now until October in the Santa Ynez Valley) I throw on this uniform twice a day, every day. When I first wake and there is still a chill in the air, I’ll go outside, water, look at my plants, check for bugs and pick any fresh fruit or veggies. Even when I was working a desk job this was my favorite way to start the day. I circle back at the end of the day, before the sun sets, to do all of the same, minus the watering. Usually we’ll have some frost into April, in which case I’ll cover my seedlings with blankets to protect them. I sometimes think I love my plants like some people love their animals. You put a lot of effort and care in getting them to this point and the idea that a little dip below 32 degrees F could squander all of that is heartbreaking. I know. There are people starving in Africa. But sometimes it’s the little things that give us joy and purpose. While I haven’t had to cover anyone with blankets this year there has been an interesting side effect to not having any frosts….that would be bugs. Lots of them. I don’t think of where we live as a bug-heavy place, but this year, they’re everywhere. Flying ants, mosquitos, mosquito catchers, flies. Without frost to help us balance some of this out (read: kill them), they’ve outnumbered and out-powered us at a scary rate. Not a big fan of bugs unless we’re talking ladybugs. Then I’m cool. My point to all of this is: I’m actually a farmer at heart. A small farmer (that loves cashmere and espresso), but a farmer nonetheless. By the middle of summer I’ll stop and survey my nine planter beds and yearn for a full acre to plant and care for. Don’t even get me started on my rototiller dreams. A girl can wish. I was pretty excited when the California Strawberry Commission invited me to come visit a strawberry farm up in Watsonville. Face-to-face with a real farmer…someone that’s devoted their life to strawberries, dirt, water, sunshine and balance. Amazing. I spent the day walking through rows of berries, talking about bug maintenance and looking at some of the most beautiful strawberries I’ve ever seen. The fields were immaculate and well loved. I learned some fascinating facts about strawberry farming in California, like 90% of the strawberries in the US are grown in California. Did you know this? 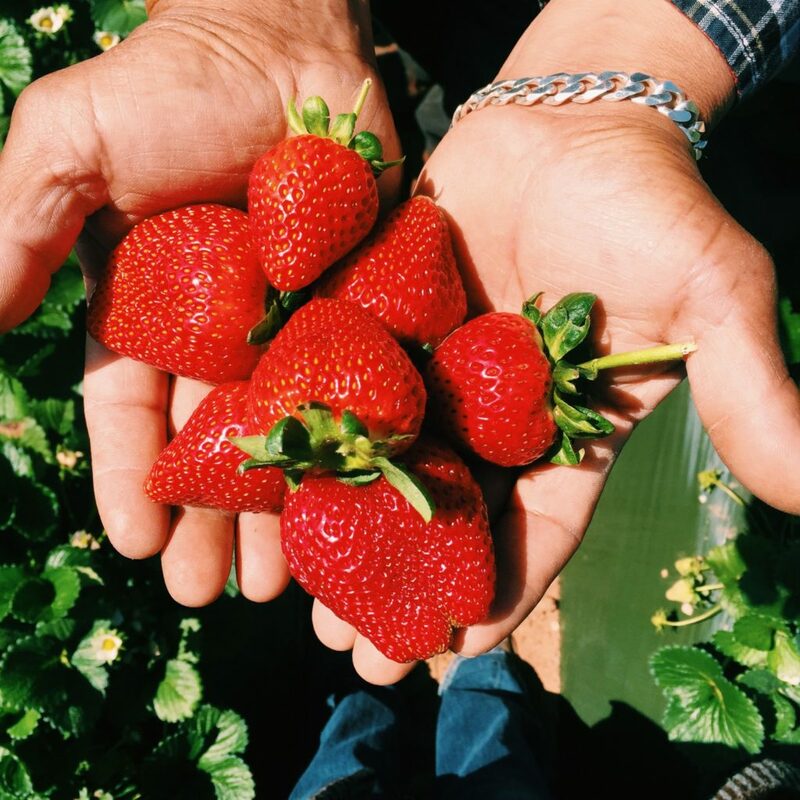 One of the more impressive facts about California strawberry farmers is that they spend millions of dollars in research on non-chemical farming methods, more than any other commodity group worldwide. I like this. 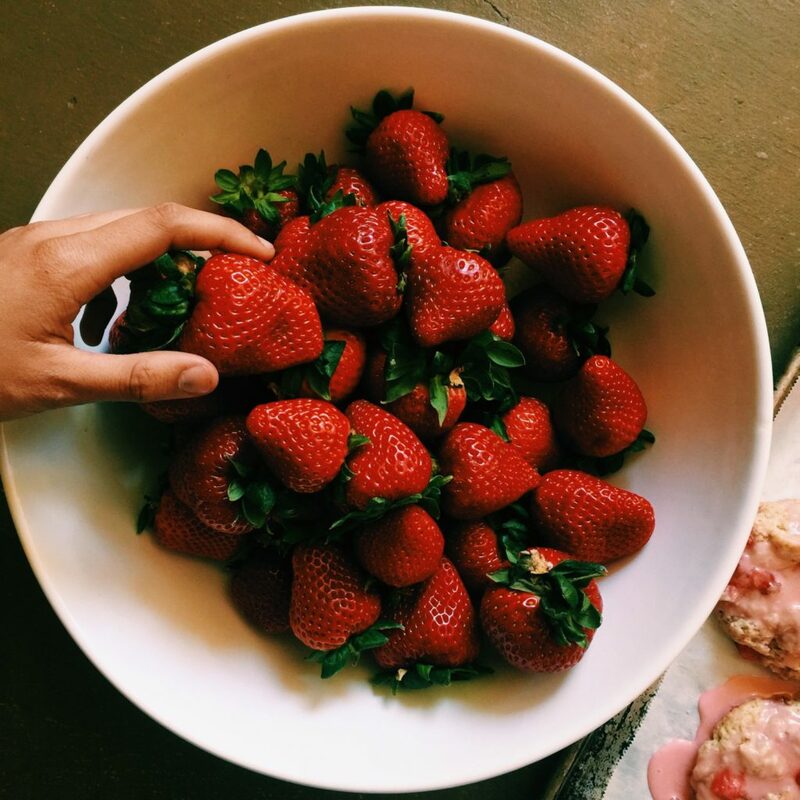 We had a delicious, strawberry-heavy lunch (buckwheat pizza with strawberries and a heavenly pork tenderloin with strawberry chutney) and talked about all of the health benefits of strawberries (more vitamin C than an orange and low glycemic…wha??). My mind naturally started drifting to scones. All of this healthy fruit totally negates cream and butter. Right? 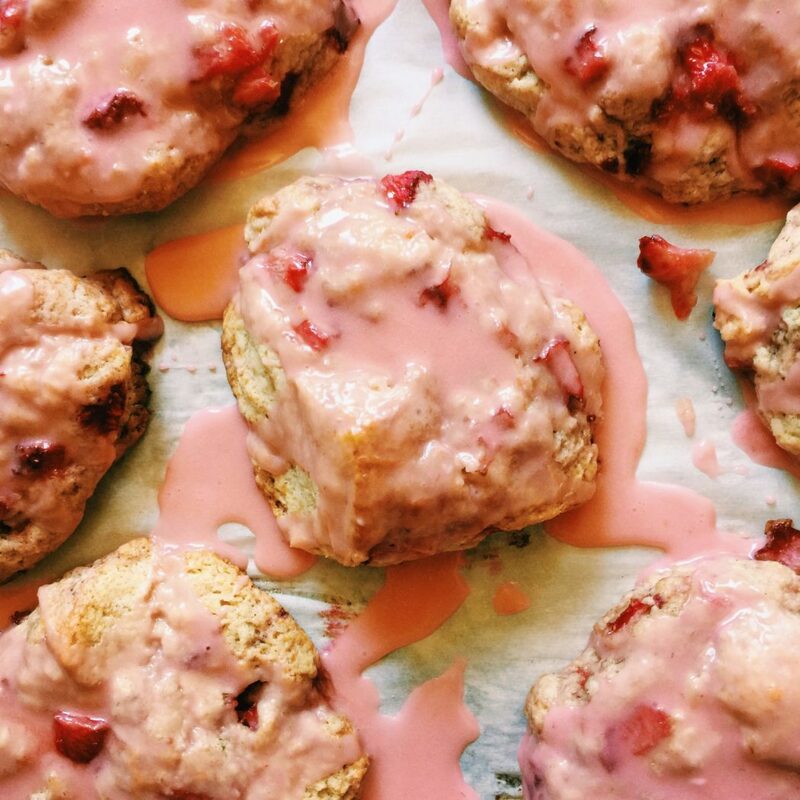 I don’t know why I haven’t made strawberry cream scones before, but it seemed the time had come. They loaded us up with a flat of big, beautiful, vibrant strawberries and off we went to create something fabulous. Keep all of your cold ingredients cold. I’m talking about the cream, egg and butter. Don’t let them sit around sweating on the countertop. You want them nice, fresh-from-the-fridge crisp. We’re going to macerate our berries. You want to first give them a nice, small dice. Try to make each strawberry bite roughly the same size. Throw these in a bowl and toss with 1 tablespoon each lemon juice and granulated sugar. Stir periodically while you’re getting your dry ingredients together. When it comes time to add the berries to the scone dough, make sure you really strain them (reserving the liquid) by pressing as much moisture out as possible. You will later use the reserved liquid to make the glaze. Yes. You heard me. It’s going to be amazing. Let’s talk about baking powder. You MUST use double acting. It sounded like I was going to have a lot to say on the topic, but that’s it for now. I have lots more scone tips here. 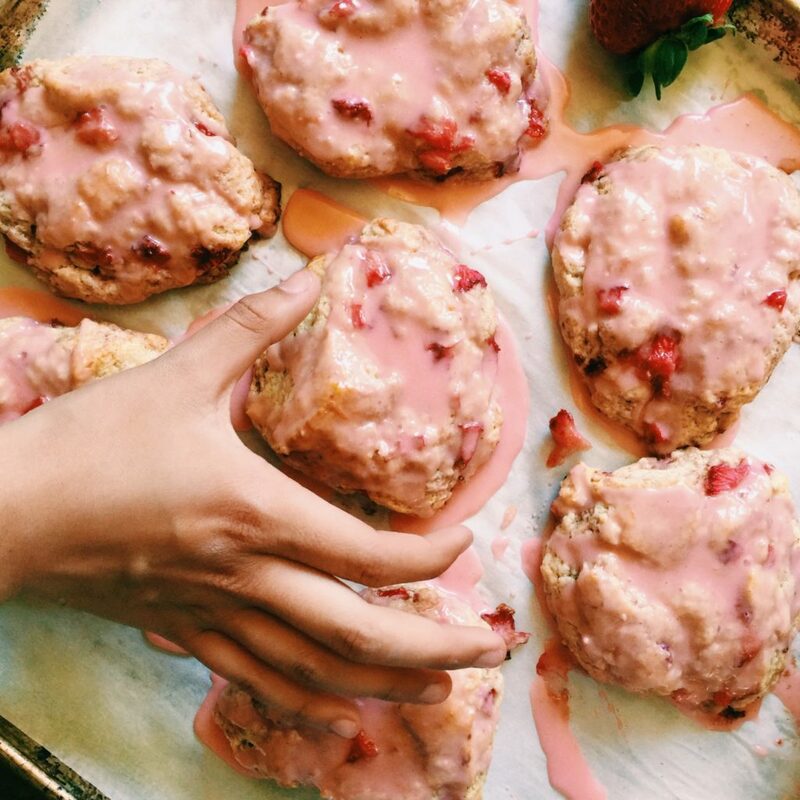 I think these strawberry cream scones would go really well with some champagne. Would you be a dear and pop some open for us? In a small bowl combine your chopped strawberries, lemon juice and granulated sugar. Stir periodically while you putting together the remaining ingredients. In a medium bowl, whisk together the cake flour, flour, sugar, baking powder, cinnamon and sea salt. Cut the chilled butter into the flour mixture using a pastry blender, two forks or your hands. I like to work the flour down to the size of smallish peas. Mix the egg and 2/3-3/4 cup of cream together in a small bowl and then drizzle over the flour mixture. Using a fork, stir until it just starts to form a cohesive mass. Strain your strawberries, pressing out any excess moisture and reserving the liquid for the glaze. Set aside the liquid and add the berries to the scone dough. I like to use a fold and press technique when adding the strawberries. Fold half of the dough onto itself and press down so that the berries are in the middle. Grab any rogue strawberries, set them on top of the dough heap and repeat the process until it looks just mixed. The addition of fresh fruit will make the dough a bit slick and snotty…don’t panic. It’s perfect. Just add a little flour to your hands as needed, to keep sticking to a minimum. Line a cookie sheet with parchment paper or a silpat. Lightly dust with flour. Lightly flour a surface (cutting board or clean countertop) and separate the dough into four equal-size lumps. Mold each lump into a disc, about an inch and a half thick, with nice, crisp 90-degree angled sides. Don’t overwork your dough. This should be your mantra when futzing with dough. Set the discs onto the parchment-covered baking sheet. Pop the discs, uncovered, into the freezer. Set the timer for thirty. You can skip this step if you’re short on time or patience…the freezer just helps them get a little more lift off and keep their shape while in the oven. I will also say, that if your dough is on the stickier side (because it’s humid), this will definitely make it easier to handle…especially when you’re trying to cut it. Heat oven to 400 degrees F and make sure you have a rack in the top third of the oven. When the timer goes off, pull the scones out of the freezer. Using a sharp knife (I love my bread knife for this), cut each disc into four, equal-size scones (you’ll end up with a total of 16). Make sure to cut up and down and don’t use any see-saw action when cutting. You may need to lightly flour your knife in between cuts if it’s sticking a bit. Pull the scones out at least two inches from one another…they need room to expand. Put the scones in the oven and set the timer for 15 minutes. After 15 minutes, look at them. I often rotate the baking sheet and give them 1 more minute at this point. How do yours look? Are they nice and puffed up? The slightest bronze happening? When that’s their appearance, they’re done. Let them cool on the sheet, in a draft-free area, for about 15 minutes. Meanwhile…whip up the glaze in a bowl by adding the powdered sugar and stained berry liquid and mix. If necessary, add a little bit of water or powdered sugar, in 1 teaspoon increments, to get to the desired consistency. What’s the desired consistency you ask? Thin enough to pour and thick enough so that it stops in its tracks and doesn’t just fall off of the scone. Grab a large spoon and drizzle the glaze over the tops. Sometimes I like to cover most of the tops and let it run down the sides. Other times I like to splatter, in a Jackson Pollock-like manner. Create your own style. Be a boss. More tantalizing scone recipes: Cherry Almond Scones, Blood Orange Scones, Gingerbread Scones, Cranberry Orange Scones, Maple Oat Scones, Pumpkin Scones, Thai Thai Scones, Bacon, Chive + Cheddar Scones, and Raspberry + Blueberry Scones. Recently on DisplacedHousewife: Chai-Spiced Granola Oatmeal Cookies, Chai-Spiced Granola, Thai Noodle Salad, Chocolate Rye Stout Cake + Marshmallow Whiskey Meringue, Tart Cherry Almond Scones, Harissa Sliders with Feta-Harissa Secret Sauce, and Brown Butter Muscovado Snickerdoodles. Really happy my taxes are over. That’s all. i loved watching you make these on snap, and had a load of berries at the time but didn’t get around to making these. but i’m determined to this summer when i get my hands on some sweet little guys. your experience with the farmers sounds just like something i would geek out on. i know how difficult they are to grow, and i have so much gratitude for those who have stuck it out. we reap such berrylicious benefits! 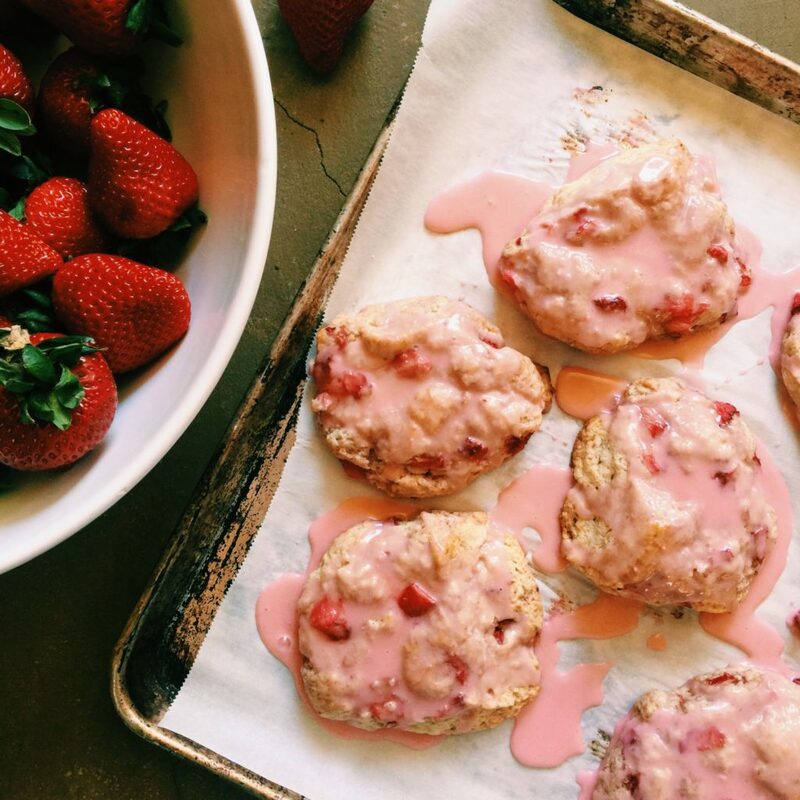 I am all about these scones and I have this strawberry obsessed son that would positively flip his lid over this recipe. That glaze – oh my! Now I know what I’m doing this weekend! Oh my Rebecca, these look incredible!! I’ve never met a scone I haven’t loved!! And I can telll, I’m going to LOVE these!! That strawberry glaze looks amazing! Great idea to use the macerated berry liquid! Can’t wait to try! i love the color of the glaze! and #humiditymatters is so true; not just for scones, but all baked goods! i’ve definitely had finished desserts start to sweat and buckle and do gross things when the air is too wet.